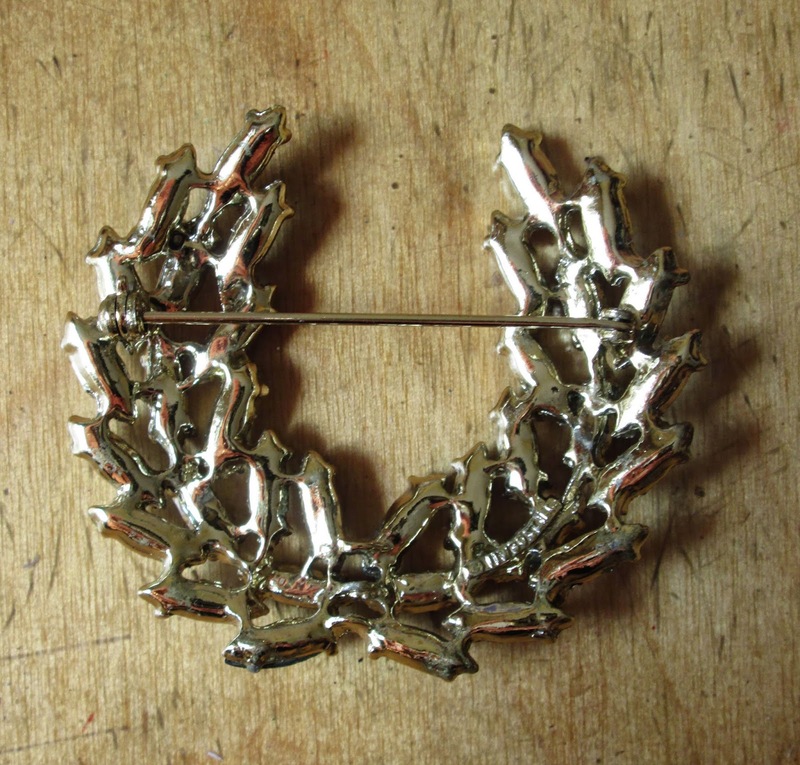 A lovely brooch by 11 W. 30 St. Inc.! There’s a great thrift shop not far from my apartment where I have had good luck finding colorful brooches. On a recent trip with my daughter our eyes both went straight to this blue beauty. It was just $14. Sold! When I’m looking at a brooch I have two criteria to meet before making a purchase: 1. Do I love it? 2. Does it have all its stones? One of the many terrific things I learned from attending the exhibit Fashion Jewelry: The Collection of Barbara Berger—and learned from Barbara herself!—is that you have to make sure all the stones are intact before buying anything since she said it’s difficult, if not impossible, to replace missing stones. Barbara also spoke of only buying pieces you love and it was definitely love at first sight when I spied this brooch in the case so I was happy to see that every stone was in place. My daughter loves blue more than any other color so I knew even if I hesitated to buy it, she was not going to let me leave this pin behind! In addition to the color, I liked the victory wreath motif of the brooch, which seemed old school to me. Turns out I was right. Upon very close inspection involving a loupe, I found that the brooch was signed “11 W 30 ST INC.” Internet research turned up that this company was founded by William Dodds of Newark, NJ. He already had a successful plastics business but decided to start a costume jewelry-making enterprise with a partner and they called the company “Jewel Creations.” The manufacturing site was at—you guessed it—11 W. 30th Street. Whether this means it was in Newark, or, as I first thought, in Manhattan, I don’t know. The article says Mr. Dodds took over the entire business in the 1960s and after that all the pieces were signed “Dodds” or “Doddz.” Fascinating! 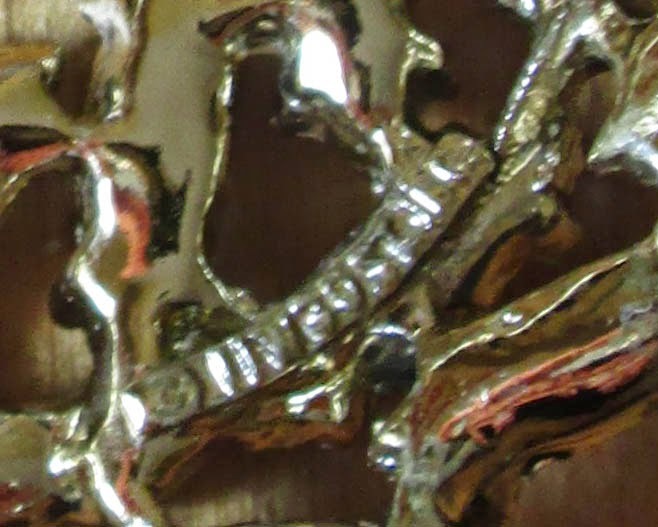 The back of the brooch. I believe these navette stones are called aurora borealis because of their iridescent rainbow hue. The same writer of the information above had a whole separate article just on aurora borealis stones and I learned that this technique of coating the rhinestones with a thin layer of metal to enhance their brilliance and give them a rainbow coloring was not perfected until 1955. Manfred Swarovski, working with Christian Dior, is the one who perfected the process, but not until after World War II when the company returned to making costume jewelry. During the war Swarovski was forced to make binoculars and optical products for the military. More interesting facts! One way I may wear it. Cardigan, J. Crew, scarf, Hermès, sunglasses, L’Wren Scott. 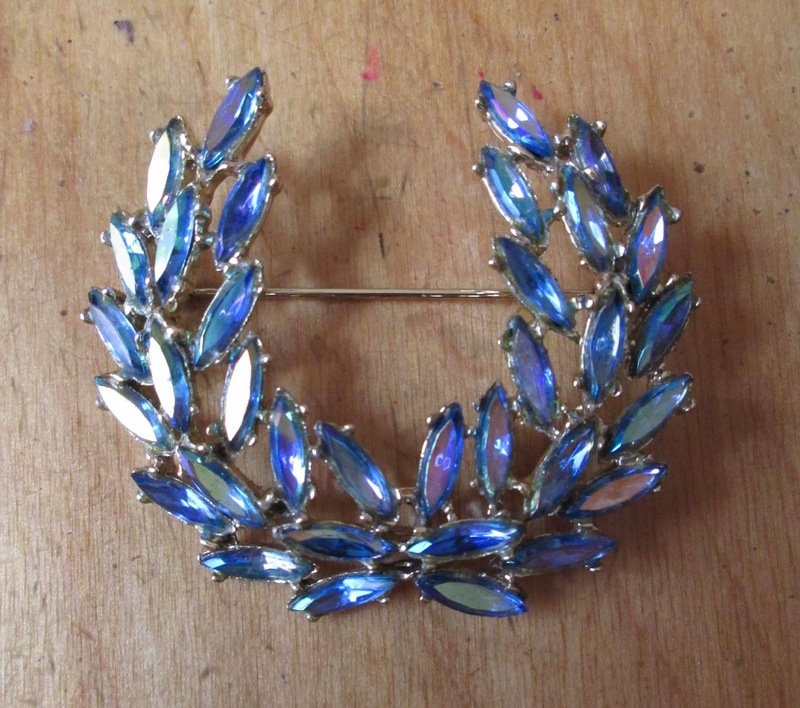 I would love the brooch no matter what (for $14 how could I go wrong? ), but knowing that it’s from the late 50s or early 60s makes me love it even more. Have you had luck finding vintage costume jewelry at a thrift shop? Gorgeous! And I love that you found out so much about it! Makes me want to get out the magnifying glass and check all of grandma's old jewelry for markings I missed! It's a beautiful brooch and I love the look of the outfit you've put together to wear it with! The scarf complements it so perfectly. I have a little vintage pin in the shape of a plane that I found at a second-hand market; you've inspired me to try and investigate its history! This brooch is gorgeous! What a great find and I love it with that scarf! Very chic, indeed. Have you entered my contest for the $1000 Gift card from Lafayette 148 New York?? A winner will be selected on Sunday, and I would love it if someone I know wins! Just go to the top of my sidebar to find the post! Have a great weekend, Jill. I have a 2 inch circle rhinestone Marcel Boucher pin. No loose missing stones - everything in tact. The marking - BOUCHER & then the company logo indicates that this pin originated in the early 50's. costume jewelry store in the USA in 1937. He wife took over the business in the late 50's upon his death & the company was sold. The pin was purchased on a whim about 15 years ago on a trip to Seattle. I spotted a vintage store & this pin called to me. This is a very dressy pin to be worn at nighttime. 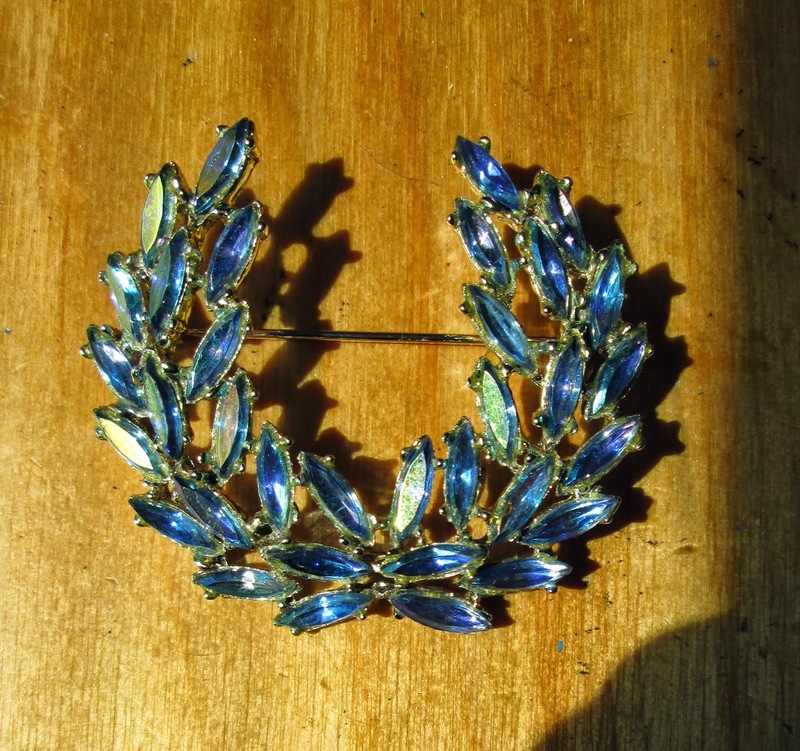 I could always dress up a black blazer with this pin, wear white or black silk pants & I was good to go. Yet, another great post. I love vintage jewelry - actually vintage anything. There's a little confusion on Swarovski. Swarovski Optik, which makes highly respected binoculars, spotting scopes, and the like, to this day, is a division of Swarovski AG, who makes jewelry, crystal, and all that stuff. They have other businesses as well. The chemical coating of glass is applicable to many areas from jewelry to camera lenses so no doubt technology was shared between the different divisions. Even now Germany, Austria and that part of Europe excels in lens and glass coating, as in Leitz, Zeiss, and of course Swarovski. Great looking brooch Jill. I have a number of brooches. I found some at church rummage sales. My piano teacher (back in the 60's) gave me brooches as Christmas gifts; except for the year she gave me a poodle figurine that changed colour based on weather. I never appreciated them (I thought it was an old lady thing) until years later; but I still have them. Hi Jill! :) Well, I've found an engraving on my pin - "1/10 GF". I've looked it up, and all it means is 10k gold filled. So not terribly enlightening, unfortunately! I've been well, thanks very much for asking. Currently in holiday-planning-mode so a little distracted from blogging! I do love keeping up-to-date with yours though, it really is so interesting and charming. Hi again Monica! Thank you for sharing that info with me, I just learned something new, I didn't know what 1/10 GF meant. Holiday planning mode, you lucky gal! Are you going to do a post on what to pack? I always find those kinds of posts helpful and enlightening. Make sure to take a Chanel polish with you for some extra glam, right? So pretty!! I like brooches on bags on stuff. Or a bunch of them on a blazer! A lucky find of a beautiful brooch!! And great price to boot!! "Christian Dior, in collaboration with Swarovski, created the aurora borealis stone. A polychrome metallic coating gave this gem a beguiling iridescent quality, echoing the style of the eighteenth-century French court of which Dior was so fond." I believe the writer of the articles I linked must also be correct that this creation of the aurora borealis stone, the perfecting of the technique anyway, took place after WWII. It would make sense that Swarovski was focused on different priorities during the war. Ah, I love this post ! Love the brooch, love the story, love the scarf ! I discovered thrift and consignment stores very recently but I've never regretted buying anything from them.